Just B AU Naturel's Organic Eye Serum is an ideal eye corrector for dark circles, fine lines, and puffiness. It is a great way to wake up with bright and moisturized eyes. 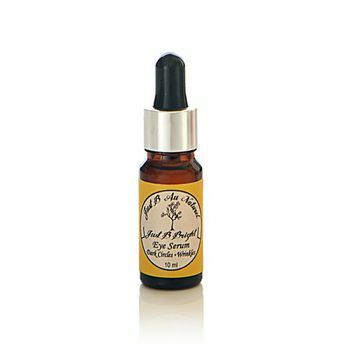 This light and quick-absorbing organic eye serum deliver hydrating and regenerative nutrients to the sensitive skin around the eyes. It is weightless, glides on evenly, and absorbs quickly. It is a daily eye treatment to support elasticity, minimize the appearance of fine lines and wrinkles, and protect the delicate skin around the eye. The powerful cold-pressed oils help fight free radicals that cause premature aging and wrinkles. Your skin will instantly feel softer, smoother and well moisturized. Rich in antioxidants, vitamins, and fatty acids, this serum also contains a blend of pure, steam distilled, organic essential oils, which assist in re-hydrating the skin. Nourishing organic oils repair and rejuvenate the skin and their anti-inflammatory properties help fade under-eye circles. The formulation delivers regenerative nutrients, leaving the skin deeply hydrated and smooth.